increased production with less effort! The vertical loop handle provides easy maneuverability. 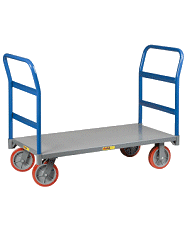 The total hand truck height with this handle is 53”. A stress resistant, straight frame for general use offers maximum shock absorption and durability. Cast aluminum nose plate is 18” wide x 7.5” deep, with a recessed heel. A great general-purpose wheel with a 4 ply, 2-piece hub, zerk fitting, and ball bearings. Capacity is 350 lbs. per wheel*. Weighs 4.50 lbs. The hand truck holds up great to everything I can throw at it. I use it for heavy appliances and even moved a few 700 lb safes with it. No signs of wear and tear after 4 months. This is the first time that I have purchased a RWM handtruck. It is a good sturdy piece of equipment, and it seem like it should give me years of good use. If you have been using Magliner, give this brand a try, you wont be sorry.